Dr. Lee and Dr. Robert Schmidt provide full implant services to replace single and multiple teeth, including a full arch of broken-down or missing teeth. 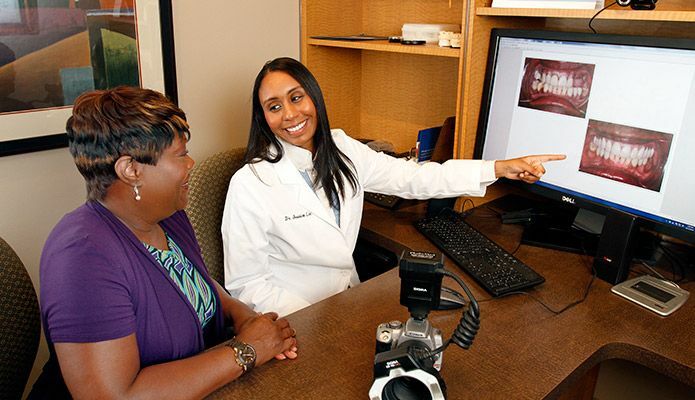 Our periodontist, Dr. Vazquez, takes care of complex cases, as needed. Missing or broken-down teeth can adversely affect your quality of life by making it hard to chew and lowering your self-confidence. 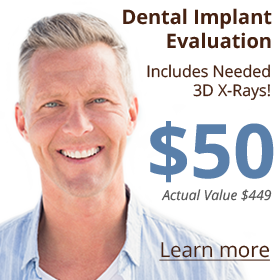 Dental implants increase your quality of life. They return the ability to chew and smile confidently with teeth that look completely natural. Dental implants are a permanent solution for replacing missing or badly damaged teeth. 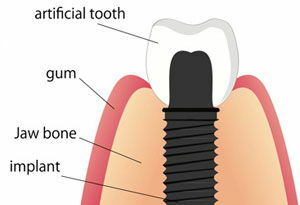 An implant is a high-tech tooth replacement made from a biocompatible substance. It’s the closest thing to a natural tooth available in modern dentistry. The implant consists of a titanium post that functions as a tooth root, and a porcelain restoration that looks like a natural tooth. With a dental implant, there is no need to alter the adjacent teeth. A single missing tooth can be replaced with a dental bridge or a dental implant. A dental bridge has the disadvantage of requiring adjacent teeth to be prepared for crowns to support the bridge. A dental implant single-tooth restoration avoids the need for the dentist to alter adjacent teeth and also replaces the support that’s been lost due to the missing tooth. Unlike conventional bridges, a missing tooth replaced with a dental implant will prevent the bone loss associated with missing teeth. When a single-tooth implant replaces a front tooth, the noticeable gap will be filled. Your smile will be natural-looking, as the restoration is made to match the rest of your teeth. Good oral health is easier to maintain with dental implants. Dr. Vazquez, our periodontist, is an implant expert. Two or more dental implants per arch snap into specially fitted dentures. This option stabilizes dentures and improves chewing ability. 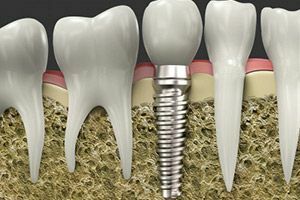 Dental implants can be used to support a bridge. 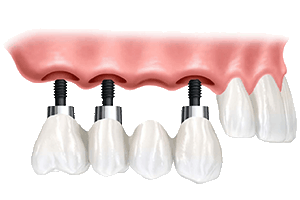 Implant-supported bridges are used to replace three or more adjacent teeth. Unlike dentures, bridges are permanently fixed in place and act very similar to your natural teeth. 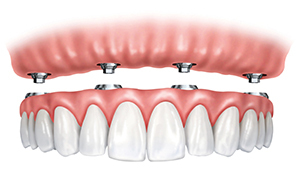 In cases of missing teeth, an alternative to multiple single implants is a bridge supported by implants. For those with missing teeth, gaps in your smile can be fixed with partial dentures. These can be secured with metal attachments anchored to your natural teeth. However, dentures are best stabilized with implants. 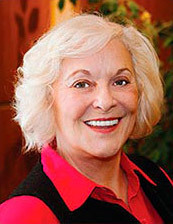 The conventional way to replace a full set of missing teeth has been to use full dentures. But dentures tend to slip and move around. And they can be very uncomfortable and painful, making eating a difficult and unpleasant experience. Dentures do not stop the problem of bone loss. That’s why long-time denture wearers often look older than they are due to loss of bone in the jaw. Patients can replace a full arch of teeth in one day using our comfortable and minimally invasive New Teeth in One Day procedure. We offer our patients stable new teeth in one day using a comfortable and minimally invasive procedure. The New Teeth in One Day technique is a modern dentistry procedure that has become the preferred alternative to dentures and allows patients to eat whatever they want! We place four implants in strategic locations and precise angles to take advantage of the available bone in a patient’s jaw. In most cases, four implants is all a patient needs to have all of their teeth restored. There are many benefits to New Teeth in One Day. This new set of teeth is permanent, doesn’t require a fake palate and provides the needed stability to eat, speak and smile naturally. The first step in the dental implant process is a 3D Cone Beam CT scan, which captures a precise 360 degree image of your head. This X-ray allows us to create a detailed surgical plan for maximum efficiency and accuracy. 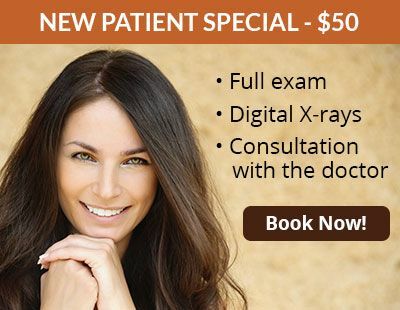 Next, we will use the 3D digital X-ray images to plan the implant procedure. A surgical guide is also made from the X-rays. We use a surgical guide for precision implant surgery. 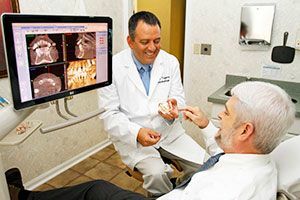 The surgical guide ensures the implant is placed at the exact angle and depth that is required for optimum positioning. We use the Piezo ultrasonic handpiece as an alternative to the conventional scalpel. This device offers more precise and gentle cutting when needed for difficult procedures, including complicated extractions and bone augmentations. This high-speed device also reduces the amount of time you are in the dental chair. We often use a centrifuge to create plasma rich in growth factors that is made from the patient’s own blood platelets. This aids in faster healing rates. “I just wanted to let everyone know what a fantastic experience I had when I had to have two implants put in. The first part was having two teeth pulled. I have had a tooth pulled before, but this experience was nothing like my last. The doctor used a new technology, that he showed me later, that made the extractions simple, clean and painless! 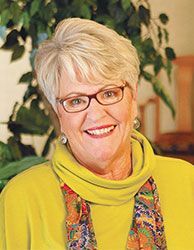 “I then started the implant surgery, which I was not looking forward to because I had heard that people had a lot of pain afterward! I wish I had not fretted as much as I did because the surgery was absolutely fine and quick and the recovery was again, amazing.